Dimensions 52.0 In. X 52.0 In. X 20.0 In. I love love love my crystal ceiling fan. It was easy to install and it looks beautiful in my living room. I have gotten so many compliments. It is "girly"... but so am I so this is perfect for me. The fan looks good. I have only given 2 stars, read below to know why. Pros: 1. it can hold up to 6bulbs and can turn on 3 at a time or all the six. So you have enough light. 2. Looks good 3. Fan has good speed if you are the person who likes it Cons: 1. I bought a remote version and the remote is of very low quality and looks very cheap. It’s some generic remote and not specifically made for this. Its from some other brand. You will definitely not want it to be displayed. 2. The remote holder is so bad that the remote just slips off from bottom when fixed on the wall. 3. 3 of the six bulbs cannot be swapped unless you remove the fixture 4. The instructions are very bad. They will mislead you, talk about parts that are not in the box, but everything you need is still there. 5. There are not enough wire nuts (seriously? ), remote receiver itself need 6. 6. I am very handy but this is very bad for DIY. You will need small hands, screw drivers with thin long stems etc. you will definitely feel frustrated at some point while installing. I wanted to stop and return it but did not want to go through the dismantling hassle to ship. 7. Balancing the fan at max speed is a challenge. 8. Bulbs are of 2 different sizes and are not included. I would have payed few bucks more if it takes so that I can save a trip to the local ***. I would say if you are up for a challenge, then you can give a try. We love this light fixture! It wasn’t terribly difficult to install. I love that I can have either the top, bottom, or both lights on at one time. Changing the bulbs in the top light fixture will be tedious, as you have to remove the whole jeweled cover, but if you have small hands (or a helper with small hands), you can replace the bulbs without having to remove the lower fixture. The fan is quiet and the remote seems sturdy enough to last a while. The thing I like the most is that I can turn the light on and off from the wall switch without the remote. Overall, I would definitely recommend this! Cons: I agree it is difficult to install the top light bulbs after installation, but it's not impossible. I was able to do it. A man with large hands probably would not be able to. Also, there's flickering on the walls when the fan runs while the lights are on. There is a design flaw with the pull chain which controls the fan speed. It gets hooked on the wiring that holds the crystals in place. Pros: I love this fan! It's so unique. I generally dislike ceiling fans in bedrooms because they can be a bit plain. I'd always rather have a nice light fixture. This fan was the perfect compromise. It adds a bit of glamour without looking like a bad hybrid. 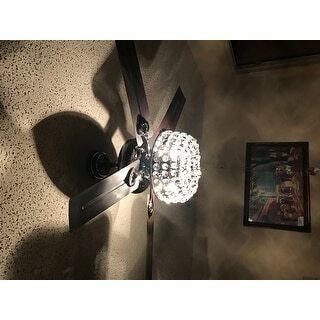 Purchased this fan to go in my family room to give it a little glam but not too much. The fan works beautiful, low noise level, and was very easy to install according to my husband. It is a beautiful fan and I do not hesitate to recommend it. 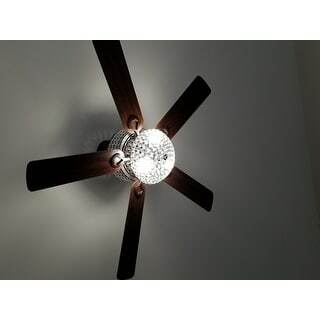 This is the best ceiling fan that I have every purchased. It makes my room look stylish with the crystal lights. I can you either turn on the top light, the bottom light or bother and the same time. It's so pretty and I'm happy I made the purchase. I love the richness of this fan ... it is feminine but also masculine. looks really nice in master bedroom. The crystals look class and elegant, as well as they look expensive and nice. This is also unique because it has the crystals on the base and the above the blades. Love the fan! It added a whole new look for my master bedroom. I wanted a chandelier and my husband wanted a fan. We both got what we wanted! You can turn on just the top lights or bottom lights or both sets of lights. The fan is quiet which is a bonus too. This chandelier Fan It’s absolutely beautiful. The Crystals Brightens up my bedroom. I love the mix of styles in this fan. The crystals give it a modern and glamorous look while the wood tone blades give it a rustic look. It is perfect for our cottage's guest room! I also love that it has two lights that work independently of one another and the fan is whisper quiet too! First,fan is beautiful.Bought for christmas gift and just installed. Fan operates but no lights.Assembly instructions reference one white and one blue from switch housing to be connected to one white and one black from light-problem is light has 3 wires-red,blue and white and switch housing has only two-red and white. tried different combinations to no avail. Please send correct wiring instructions or I'm going to have to return it! This is one of the best ceiling fans for our family/living room. 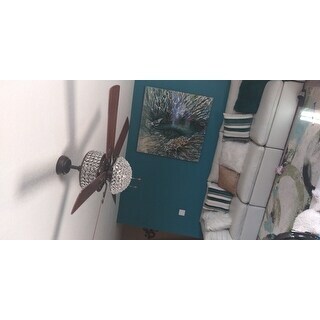 It matches our decoration, the fan is very silent, it produces bright light. and its affordable. The look is stunning! the only flaw is putting the bulbs, make sure that you assemble the ligh first before you put it up on the ceiling. My electrician put this light up in my master bedroom and it really sets the tone for my room. I love it. To install the bulbs in the top tier, ask the electrician to unscrew the 4 screws at the top, insert the bulbs, then remaster the screws. Make this is done before putting the fan togather and definately before installation. It's a gorgeous fan but the design is poor. Don't expect to put in or ever change the lights above the blades. That's where we stopped and returned. Overstock customer service was amazing, you can buy with confidence here. I was looking for a ceiling fan for the living room and wanted something that stood out. I found this fan, purchased it but had to add an extension because my ceilings are really high. 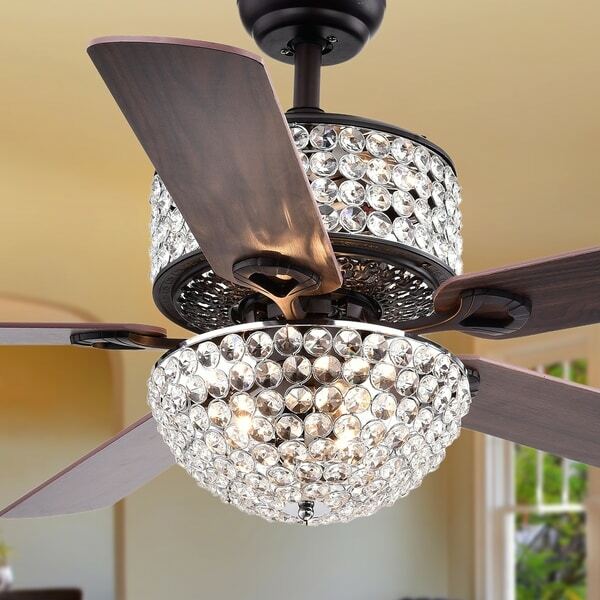 It looks great and adds bling to the typical boring ceiling fan. I Love the style and elegance this fan adds to my living room! I LOVE this fan! 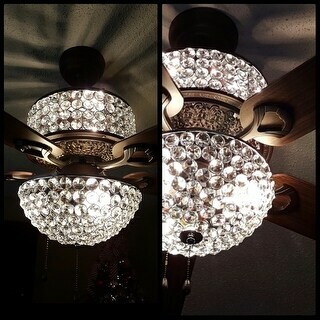 I wanted something that was girly like a chandelier, but functional like a fan. I put florescent white bulbs in it and it really lightens up my room. The remote functionality allows me to change cycles at a whim. I do wish the remote was the wooden color of the blades instead of the cream color and plastic, which would match my rooms aesthetics better since I have my remote out ALL the time. Overall, I love this fan! I purchased 2 of these adorable ceiling fans, one for the downstairs living room and one for the loft area upstairs. They are actually prettier in person. I thought the lights worked separately. Upper and lower. Fan is very beautiful. We put this in our living room. Beautiful and unique. Get a lot of compliments on it. "can this fixture be dimmable?" We do not recommend controlling this fan with a dimmer. *** Using a standard dimmer with any ceiling fan can damage the motor, and/or cause the dimmer and/or motor to overheat and cause a fire. "What is the inner demension of the downrod"
This fan uses a 1-inch diameter rod for the downrod.
" Can you use an extension down rod?" You should be able to compatible down rods at larger hardware stores supplying ceiling fan accessories. "Can the lights work separate, the bottom off and the top on and so forth.....?" You should be able to toggle between the upper and lower lamps. "Hello, Are the crystals glass or plastic?" The crystals are made from high quailty crystal glass. "Will the fan motor malfunction when using a wall dimmer switch? " The fan motor is wired separately from the lighting. So, no it would not malfunction. "I love the top portion of bling but not so much the bottom. Can the bottom light kit be taken off the fan? Can it be capped off?"